St. Augustine Beach is old Florida at its best! Retaining the old world charm of St. Augustine, it has no high rise condos. Instead you will find minimal traffic, quaint beach neighborhoods and local bars and restaurants. The people are friendly and the atmosphere is decidedly laid back. With an abundance of Florida sunshine, it has beautiful weather year-round to enjoy walks on the beach or a stroll to a nearby restaurant. 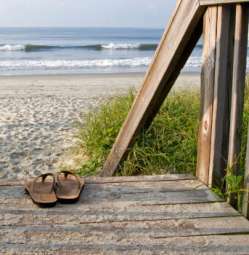 Best of all Surf and Sand OceanFront Beach Rental is located in the heart of St. Augustine Beach! Here are a few places located near the house within walking distance. The Pit Surf Shop is a great place to rent surfboards, kayaks and bicycles. 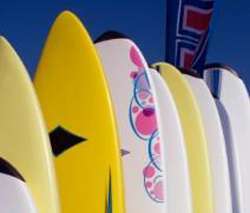 It also offers surfing lessons and an assortment of beach clothing and accessories. Adjacent to The Pit is Stir It Up, an organic takeout serving salads and sandwiches. The Beachcomber is a favorite with the locals. 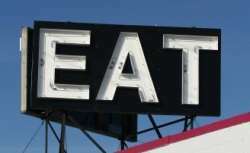 It is an open air restaurant and bar directly on the beach and is known for its fish tacos and cheeseburgers. Mango Mango is another popular restaurant and bar known for its Caribbean themed menu. Sunset Grille is known for delicious salads, sandwiches and seafood entrees. Panama Hattie's is a fun place for food, drinks and live music. Dunes Cracker House and Pub also has live music, drinks, food and a lively atmosphere. Rita's Ice Cream is a great place to get the best soft serve in town! Fiesta Falls Putt Putt is a fun place for the entire family! The Pier offers many beachfront amenities and is a great place for the avid fisherman! Located one block from Surf and Sand is Jack's Bar-B-Que. Owned by a former St. Augustine Beach city commissioner, it is a classic old Florida open air restaurant and bar....with a difference. It has a swimming pool for the use of its customers! Grab a sandwich or a drink then watch the kids swim. Weekends they have live music. Sometimes (if the ocean isn't too loud) you can hear it drifting by when you are sitting on the deck of the Surf and Sand OceanFront Beach Rental.